On January 25, 2019 the Digitale Charterbank Nederland [Digital Charter Database Netherlands, DCN] was launched at Het Utrechts Archief in Utrecht. In this project the Huygens Institute/Institute for Dutch History of the Dutch Royal Academy of Sciences works together with Het Utrechts Archief, many other Dutch archives, and the IT firm De Ree in Groningen to create an online database with not only medieval charters, but also charters written between 1500 and 1800. Among the speakers at the presentation was Els De Parmentier (Ghent) who made an illuminating comparison with the Belgian project Diplomata Belgica. It is only natural to compare both projects and to report on some early impressions. In fact two previous attempts at the Huygens Institute to create an online database for all medieval charters in Dutch holdings had not reached their goal. Almost by chance financial support of the Dutch Science Foundation NWO, the presence of an archivist, Karel Engbers, who had recently joined the staff of the IT firm De Ree which supplies an archival system use at many Dutch archive, and the preparatory work of the Huygens Institute together resulted within eighteen months in the current database. The DCN has a search screen with both a simple search and an advanced search mode which opens by clicking on arrows. The advanced mode is fairly restricted. You can search for phrases and for single words, and you can set a time period to limit the search results. 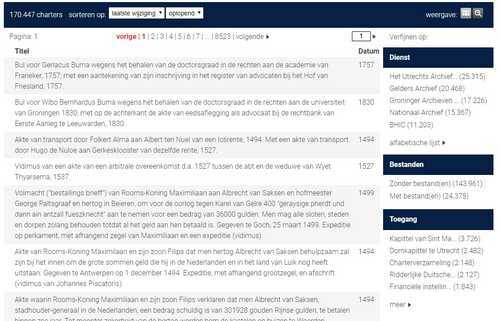 The search tips lead you to the Dutch archives portal created by De Ree. The portal has a search interface in Dutch, English and German, but the page with search tips is only available in Dutch. In the top menu you will not find in the English and German version the choice for newspapers (kranten) and the very useful guide to institutions with holdings for cultural heritage (erfgoedgids). I did not want to go immediately to another track of this post, but you can hardly escape from the crucial role played by the archival system of De Ree. In fact the start page of the DCN looks below the introduction very much like the result pages of the Archieven portal. On the right you can use filters for archival institutions (diensten, shortened from archiefdiensten), the presence or lack of images and other files (bestanden), and for toegangen, finding aids. By the way, Het Utrechts Archief figures large with more than 25,000 charters, but as for now only for some 6,600 items digital images have been provided. For each charter you can go directly to the relevant finding aid. Currently the database of the DCN contains already 170,000 charters with for some 24,000 items digital images. The proof of the pudding is in the eating, and thus two invited speakers, Hans Mol (Leiden University and Fryske Akademy) and Ronald van de Spiegel at the presentation gave an early report about the functions of the DCN. Finding all occurrences of the abbot (abt) of Middelburg proved to be not straightforward. The use of wildcards is of course important in view of the different spellings of names and locations. With the DCN you can chart for example the changes in the preponderance of papal and royal charters or measure the importance of towns. More disconcerting is the way the datations of charters can led to a presentation of results with in the date field the number 1000 – or another year starting with 1 – instead of the date in the description. In order to work properly the archival system needs to have correct input in its own datation field of the finding aid. Instead of blaming this particular system – or any system for that matter – you will have to look more carefully at the quality of the original input created by archivists. Some crucial fields might have been left empty, and sometimes even a clear indication you are dealing with a charter might be absent. The institutions using De Ree’s system can continuously add and correct their data, but those institutions which do not use it cannot easily update their data within the DCN. Karel Engbers (De Ree) explained how he urged to widen the selection of charters mentioned within the finding aids at the beginning of the project and during its unfolding. He urged for instance to include also specific genres of charters, and also the occasions where only a top-level description is given, even the most superficial ones like “a bundle of charters, 1350-1550”. Maybe you will already have some ideas about the DCN, but I think you can see them much clearer when you compare the DCN with Diplomata Belgica. In fact I would have preferred to write here about this outstanding digital project much earlier, but things went different. The subtitle of this website with a French and English interface clearly sets its limits and character, “The diplomatic sources of the Medieval Southern Low Countries”. You will find here charters from the territories corresponding more or less with the current country Belgium. The word diplomatic stems from the auxiliary historical science diplomatics, the discipline dealing with medieval charters. For practical reasons, the sheer number of medieval records, this discipline often halts at the year 1300, and only seldom much later, up to 1340. In her lecture Els De Parmentier made it very clear how you can use Diplomata Belgica to search for very specific questions about medieval charters, giving you a very comprehensive range of fields with both diplomatic and additional information, in particular the presence of religious orders. Apart from the main search interface you can use the interface Recherche Tradition / Tradition Search to search for the textual transmission of charters: as original or as a separate copy, in particular repositories, the writing material, the name of manuscripts and even the Stein number for French cartularies. Perhaps the most important information of De Parmentier’s lecture was the attention to the multiple way you can study charters: within the text of a document, in documents with the same actors, documents with identical compositions, and for example in documents issued by a particular person or institution for the classic research into the working of medieval chanceries. I will leave out here her comparison with other digital projects for medieval charters, for example those at the French Telma portal, the Digitaal Oorkondenboek Noord-Brabant, the Cartago project for charters from Frisia, Drenthe and Groningen, the registers of the Hainault counts of Holland (1299-1345), the international Monasterium project. the Anglo-Saxon charters and the DEEDS project. Each of them has many qualities, but all are slightly different in their approaches. Their common denominator is the choice of approaches founded on diplomatics. Some impressions become clear after De Parmentier’s lecture. In its current form the DCN is mainly what it shows on your screen, a set of charters filtered from the online finding aids of a large number of Dutch archives and from data sets – and images – provided by some other archives. You can see quickly where to go for rich holdings, but the crucial quality of the data provided by these archival institutions is very clear, too. It is a bit silly to see lots of charters dated in 1000, 1040 or 1085 when you know the actual number of charters for these years is much lower. The time range of the DCN goes considerably beyond the normal scope up to 1300 of (digital) editions of charters for particular regions or princes to include charters issued between 1500 and 1800. The DCN faces a serious problem with the way datations of charters are handled due to the quality of the input provided by holding institutions. Sometimes one date field with incorrect or insufficient information can lead to a wrong representation of the actual date range. Instead of grumbling about this state of affairs it is perhaps wiser to check the actual input and the cases which are or seem incorrect. The larger lesson is for many digital projects you will need to use fields in a correct way, think only of such standards as EAD (Encoded Archival Description) and Dublin Core, and of course for your own digital presence and services. Sooner or later you will want to share information. Many Dutch archives offer their finding aids also as open data, yet another spur for checking interoperability and correct working before connecting to other projects or presenting data to the general public. In a finding aid archivists describe items as succinctly as possible but uniquely distinguishable from other items, and it should be no surprise descriptions do not contain all possible information, let alone full transcriptions. Some archival institutions provide transcriptions, for example the Regionaal Archief Tilburg. The DCN website mentions a diplomatic definition of charters, a single act written on parchment or paper pertaining to a legal situation or a legal action – e.g. a sale, a donation – made legally valid by the internal and external characteristics of the deed, such as a seal or a signature. For me the use of the phrase bevoegd persoon (authorised person) seems almost to exclude private persons. The phrase ‘Charter’ is de archiefterm, “[a] charter is the archival term”, wordings written by Jan Burgers, the project leader (Huygens Institute and University of Amsterdam), is simply not correct. In the latest version of the Dutch archival terminology (2003) a charter is defined as a document containing an act validated by one or more seals or a notary’s sign. This definition clearly differs from the definition in the famous Dutch manual by Muller, Fruin and Feith (1898) who saw a charter as the expedition (grosse) of an oorkonde, to be distinguished from a concept or a final version (minuut). The 2003 definition is much clearer about the documentary nature and more succinct. It is foremost an archival definition, and not primarily a concept from or defined by the needs of diplomatics. Luckily the explanations by Burgers about the importance of charters as historical sources are on spot. In my view the Digitale Charterbank Nederland is a tool which reflects archival practices and needs. Its great power is the way you can look at charters within their archival context instead of seeing them only as specimens of a separate documentary genre, and having images of them on your screen. The search possibilities of the DCN are somewhat restricted, even when you allow for the way you can focus on a single archival collection. It is only wise to remember two earlier attempts to create this Dutch charter database failed. Hopefully the problem with the dates in the charters can be solved quickly by the contributing archives and De Ree. Thus we will have at our disposal a primarily archival tool which supplements other Dutch digital projects for medieval charters, such as the digitized versions provided by the Huygens Institute of the oorkondenboeken for Utrecht (OSU), Holland and Zeeland (OHZ), and Gelre (Guelders) and Zutphen (OGZ). Creating links between these editions and the DCN is one of the things that will enhance this database. In particular the coverage with digital images in the DCN is still a bit low, but no doubt this will change rapidly. The qualities of the DCN should also become rapidly available with an English, French or German interface for all scholars worldwide wanting to use charters in Dutch holdings for their research. Without some understanding of archives, archival theory and the classic historical auxiliary sciences such as diplomatics, palaeography, chronology and sigillography you will and cannot tap completely the wealth of information charters can provide. This entry was posted in Archives, Digital projects and tagged Belgium, Charters, Digital archives, Diplomatics, Legal history, Low Countries, Medieval history, Medieval law, Netherlands on January 29, 2019 by rechtsgeschiedenis. A very comprehensive post. Sounds like some improvements need to be made in the future but it is always great for researchers to have sites such as these and hopefully it will lead to better research!